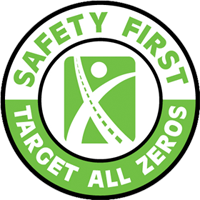 Reflective Markers - RoadSafe Traffic Systems, Inc.
Reflective markers provide safe delineation to drivers in the most adverse weather conditions. Raised Pavement Markers–These markers make roads visible to the driver in all weather conditions, these markers are engineered for performance and abrasion resistance. All types available in non-plowable and snow-plowable markers. Barrier Wall Markers–Micro-prismatic sheeted markers provide delineation for concrete barriers and guardrails. Markers are shatter-proof and bend upon impact rebounding to their original shape. They resist both direct and indirect vehicle impacts even in the coldest weather conditions. Guardrail Markers–Choose from many styles of guardrail markers that are highly visible, durable and easy to install. These markers are manufactured with virgin engineering resins and the brightest reflective tapes. They are constructed to endure the rigors of construction work zones and permanent installations. Chip Seal Markers–These markers can be installed in seconds by one worker with no special equipment, providing high profile delineation on freshly sealed roads prior to permanent striping. A unique adhesive system keeps the flexible marker securely in place.